Organizations are struggling with an unprecedented surge in data, both user-created and machine-created. With an increasing reliance on this rapidly growing data, effective scaling of data storage represents a key challenge for all enterprises. IBM® Hyper-Scale helps you easily overcome provisioning scenarios that normally challenge traditional systems. IBM Hyper-Scale can accommodate several critical client scenarios for centralized administration, data mobility, load balancing, over-provisioning, and storage system repurposing. IBM Hyper-Scale Manager is a flexible, consolidated multi-system management application that builds upon the originally released Multi-System Manager with XIV Storage Software V11.2. IBM Hyper-Scale Manager is based on, and seamlessly integrated with, the XIV graphical user interface (GUI) and spans multiple XIV systems. It virtually transforms multiple systems into a single system, allowing customers to centrally manage up to 144 XIV systems. IBM Hyper-Scale Mobility was released with XIV Storage System V11.3. It is a powerful function for moving volumes between storage containers transparently, with no disruption to host applications. IBM Hyper-Scale Consistency was released with the IBM XIV Storage Software Version 11.4. It offers cross-system consistency, enabling coordinated snapshots across independent XIV systems. It helps to ensure data protection across multiple XIV systems. This IBM Redpaper™ publication provides a broad understanding of the IBM Hyper-Scale feature. This publication is intended for XIV clients and users who want a practical understanding of IBM Hyper-Scale concepts and usage. 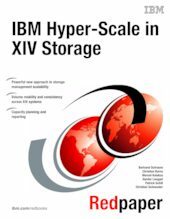 For information about the IBM Hyper-Scale concepts, refer to the IBM white paper, IBM Hyper-Scale and Its Implementation in XIV Storage: A powerful new approach to scaling storage management.